Hello Everyone! So first of all I'd just like to say a massive thank you for all your support and lovely comments on my '50 Inexpensive Blog Post Ideas' post. I never ever expected it to get the sort of reaction it did. 3 days later and it has 134 saves and is still on the lifestyle 'explore' page on bloglovin'. with some of my favorite bloggers. I literally cannot believe it. I know it's not that major but when you write a post in like 15 minutes and then it gets the reaction it does it's quite an amazing achievement. I'm so proud so thank you all. One of my biggest achievements since I started blogging. Before I get too emotional let's move on. Today I thought I'd do the usual monthly beauty favorites and I can't believe it's come to the end of the first month in 2015 already! I haven't really gone out and spent a lot buying new products this month because I have been saving for a couple of days out with my family so I've had to avoid the shops quite a bit however I have used a few new products this month and also rediscovered a few old favorites. Here they all are. Enjoy! As you can probably tell from the photo above I used quite a few lip products this month. The main being my absolute favorite lip-balm of all time the Nuxe Rev De Miel. It's just an incredible product. It's really hydrating, smells amazing and just leaves my lips feeling so soft. I did a full review on my blog earlier this month so check that out HERE. 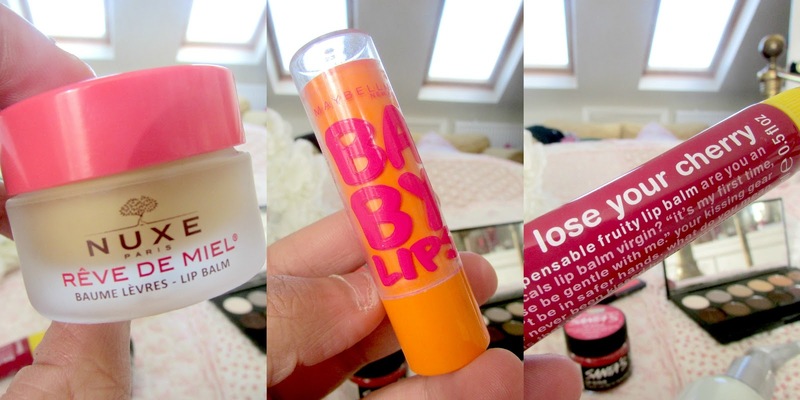 I also shopped the stash a little bit this month and rediscovered my love for the amazing Baby Lips in Cherry Me. This has been my go to lip product this month as not only is it hydrating but it provides a lovely hint of color on the lips as well. It's an amazing product. The final lip-balm that I have been using is the 'Never Lose Your Cherry' lip-balm* from the brand Anatomicals. I got sent this with the 'Love Me Beauty' January box and I absolutely love it. I'd actually describe it more of a gloss than a balm purely because it's quite sheer and gloss on the lips but it's incredibly hydrating and definitely one of those lip glosses that you can just pop in your hand bag and apply on the go. I absolutely love it. And yes I know the name sounds a bit dodgy haha! I rediscovered my love for the Sleek 'Lace' palette as well this month. I know the colors scream more of a spring/summer wear rather than a winter wear but I have absolutely been loving the middle shade called 'Guipure' which is a gorgeous shimmery powder blush. It just suits my skin tone so much, its so easy to apply and it's very long lasting. 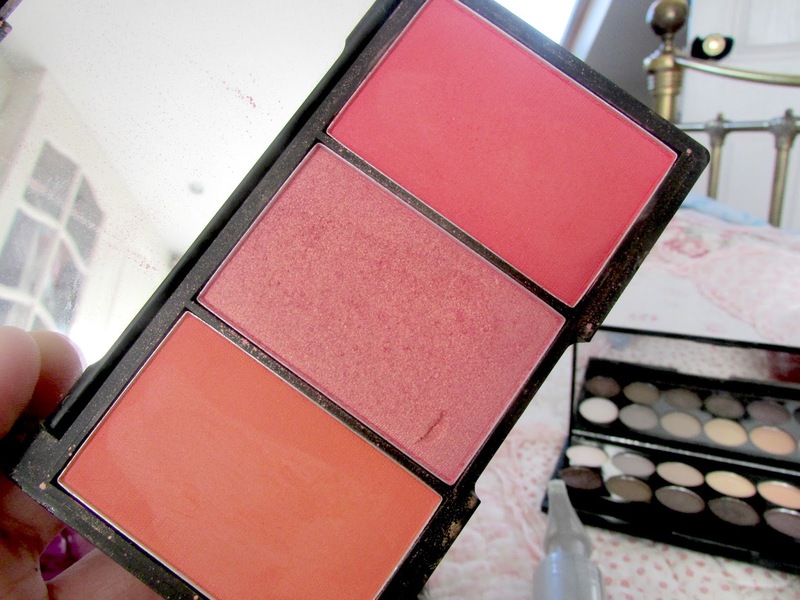 I adore this blush. 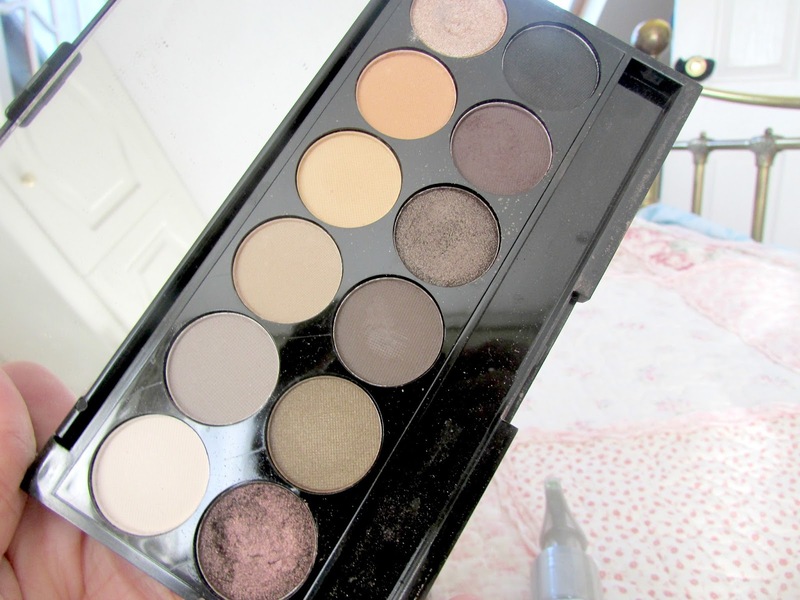 Another sleek product I rekindled my love for was the Au Natural eye shadow palette. This was one of the first shadow palettes I ever bought and I decided to repurchase it just after christmas and I absolutely love it. My favorite shade is Taupe and Conker as I think they are stunning shades and really do suit my skin tone. All these shadows are incredibly easy to work with and I'd highly recommend this palette to anyone. 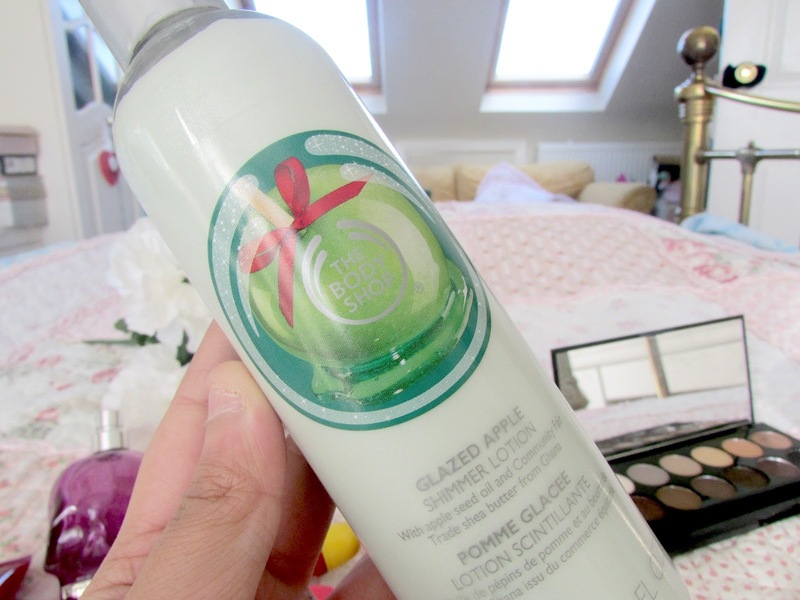 When it comes to shimmer lotions I have never really been a huge fan however I am in love with the Glazed Apple one from The Body Shop. I don't think the Glazed Apple scent is in stores anymore because it was a seasonal scent for Christmas so I am making it last as long as I possibly can but what I love about this product is the fact that it's not too shimmery. When you apply it, it just leaves a gorgeous sheen and I think it's perfect down the front of your legs and on your arms on a night out and anywhere else you want to add a bit of shimmer. It also smells absolutely incredible. I spotted this shower gel a couple of weeks ago in Waitrose with my Dad and I absolutely love it. As you can tell from the packaging it was a seasonal scent for Christmas but it was on special offer so my Dad kindly offered to buy it for me and I just couldn't say no. I've had my eye on it for a while and I wasn't disappointed. It smells absolutely incredible. I'm a huge fan of Original Source shower gels anyway as they always leave my skin in amazing condition. I'd highly recommend them if you haven't tried them before. At the beginning of the month I was doing really well with my nails and didn't end up biting them at all and then I got upset and worried and well now I have no nails left however before that I used this gorgeous nail polish from L'oreal in the shade 'Divine Indigo'* on them. I've never been one for dark nail polishes as I prefer bright colors on them however I am in love with this color. It's just so beautiful, the formula is incredible, it doesn't chip for at least 4 days and it's just incredible. I received this product with the January 'Love Me Beauty' Box too. 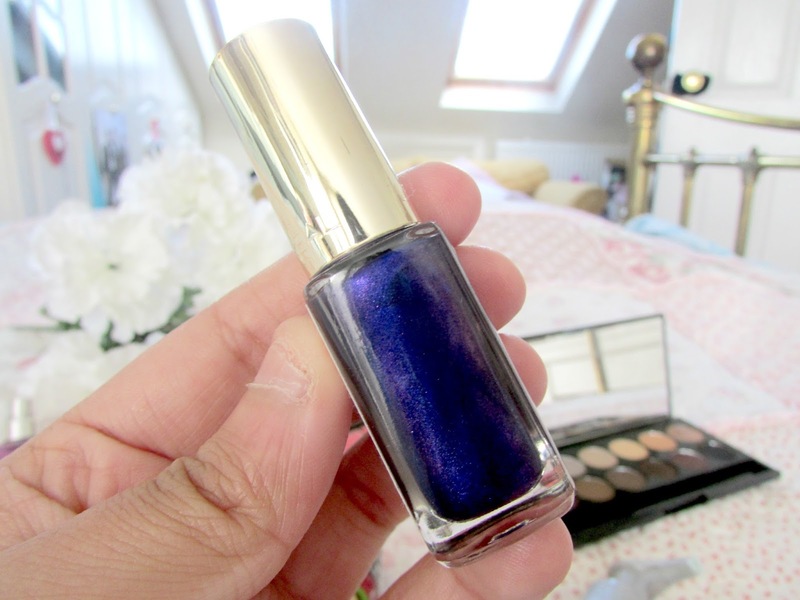 I'll be doing a post with a swatch of this and a couple of other L'oreal Color Riche polishes too so keep your eyes peeled on that. When it comes to Lush they are one of my absolute favorite brands when it comes to lip scrubs. They are just so amazing however I was a bit sceptical of this one as I don't really like cola flavored products much. However this has completely turned me around. Like with all their lip scrubs it removes the dead skin off my lips and leaves them feeling really soft and smooth. I absolutely love it. You can be sure to expect their valentines scrub in my February favorites too as I'll certainly be getting my mitts on that when payday comes round. I got this eye cream back in November and I have absolutely fallen in love with it. I literally haven't bought another eye cream since I received this with another beauty box. It's just so incredible. It's really soothing underneath the eye and really hydrates it. I use it every morning and evening and have found that it really has improved the condition of the skin underneath my eyes. If you see this in any shop I'd recommend it 100%. 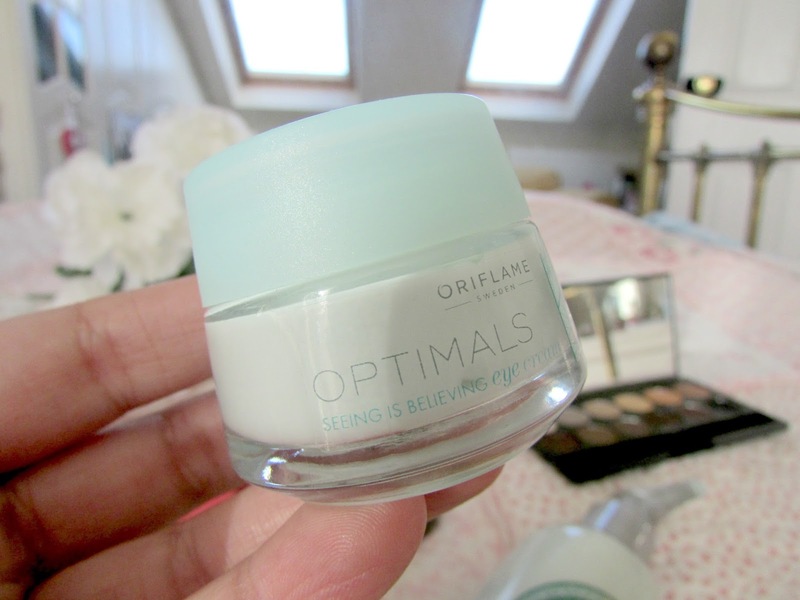 I think I'm starting to prefer this to the Origins Gin Zing eye cream and that's something I'd never thought I'd say! I received this in a little set from my Aunty for Christmas and I absolutely love it. I love using body scrubs as I find they really just buff the dead skin cells away and leave my skin looking and feeling so much healthier and really soft and smooth. 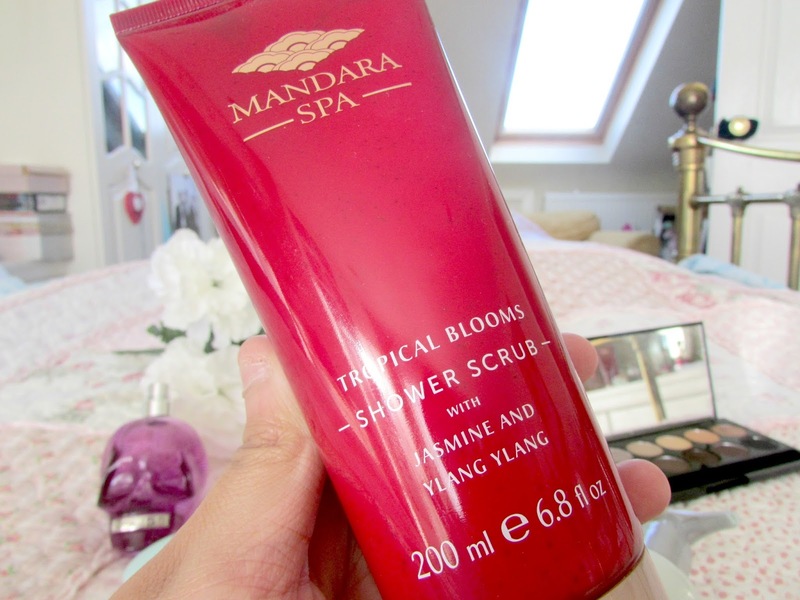 This particular scrub is incredible at that and it also smells incredible too. I'm not really one to like fresh and floral scents, I prefer sweeter scents but this has completely turned me around. It's a beautiful scent. I received this perfume of my Mum for Christmas and I've been wearing it every single day! 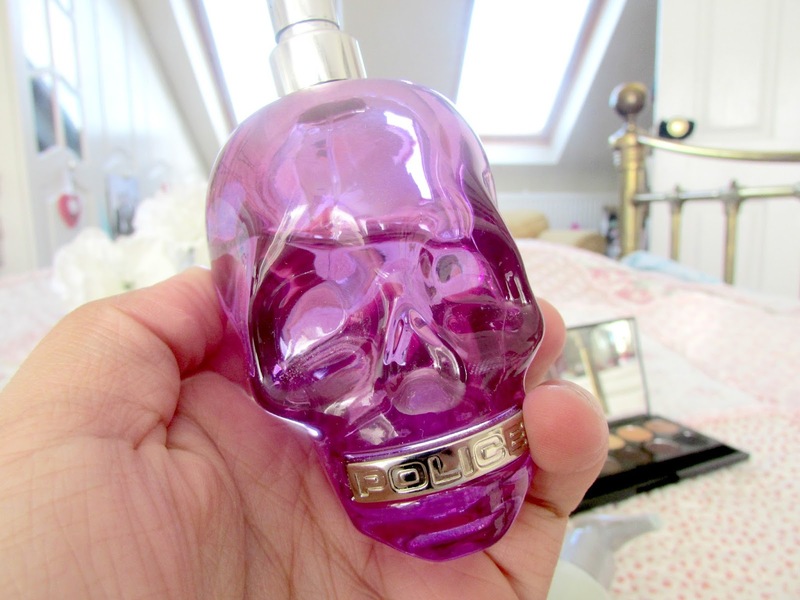 Firstly just how cute is the bottle?! Everything from the packaging to the color is just amazing. It looks so cool sitting on my dressing table. It smells absolutely incredible too. It contains notes of clementine, lime, white flowers and of course musk. It's just a gorgeous scent. I have so many perfumes so if you'd like to see a perfume collection post then leave a comment below. 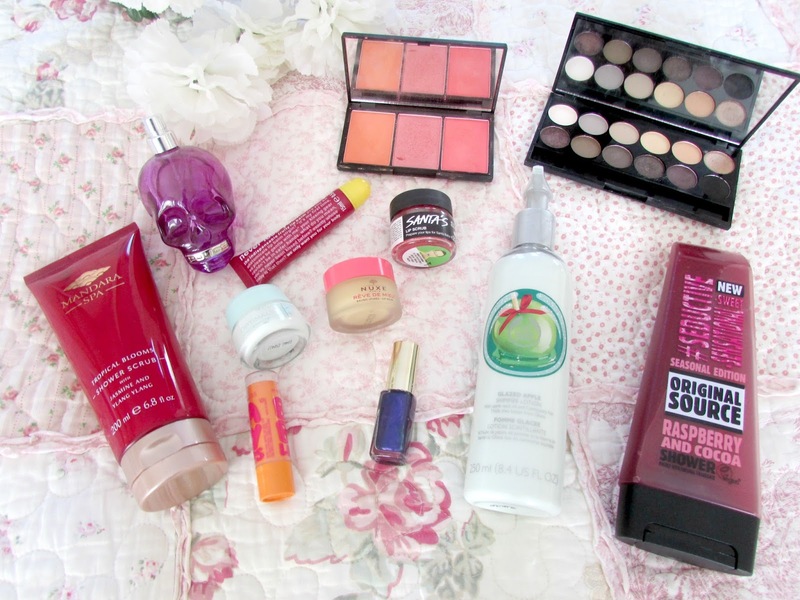 So there we have it, all my favorite products of January 2015. Next month I'm hoping to experiment more with different beauty products as Benefit are introducing a new product that I'm so excited to get my hands on and I've had a few other beauty bits and bobs on my list too so stay tuned for a more beauty filled month in February! What have been your favorite products beauty/non beauty of January? 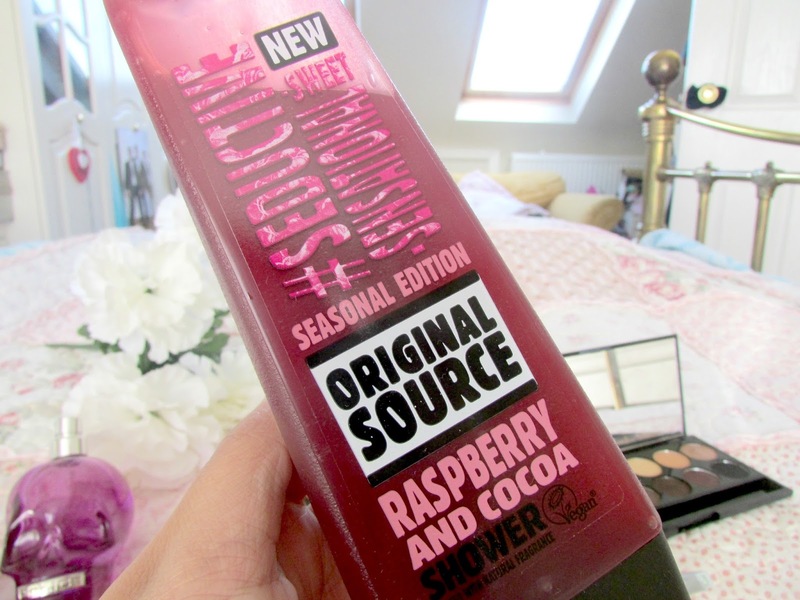 Oooh, that raspberry & cocoa shower gel looks fantastic! 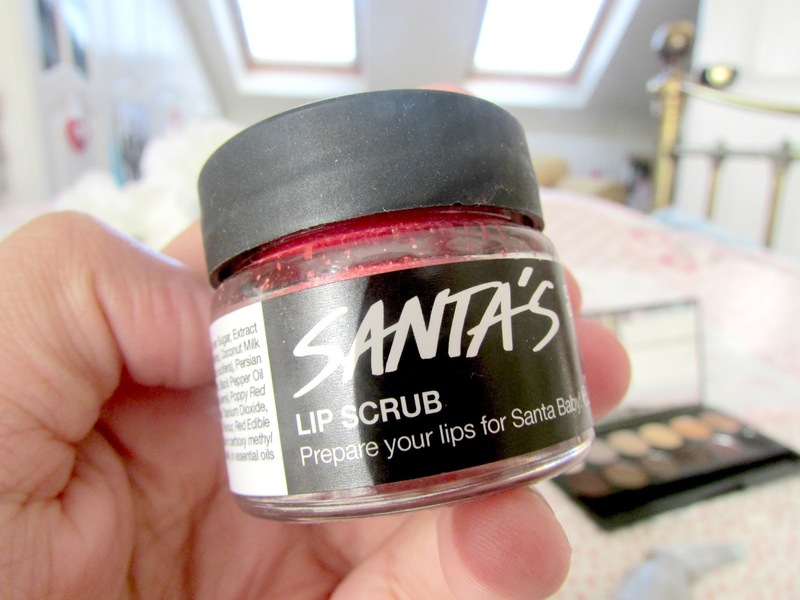 I love the Lush Lip Scrub, I own the popcorn one myself! I'm getting the nuxe reve de meil for my birthday and I'm so excited! 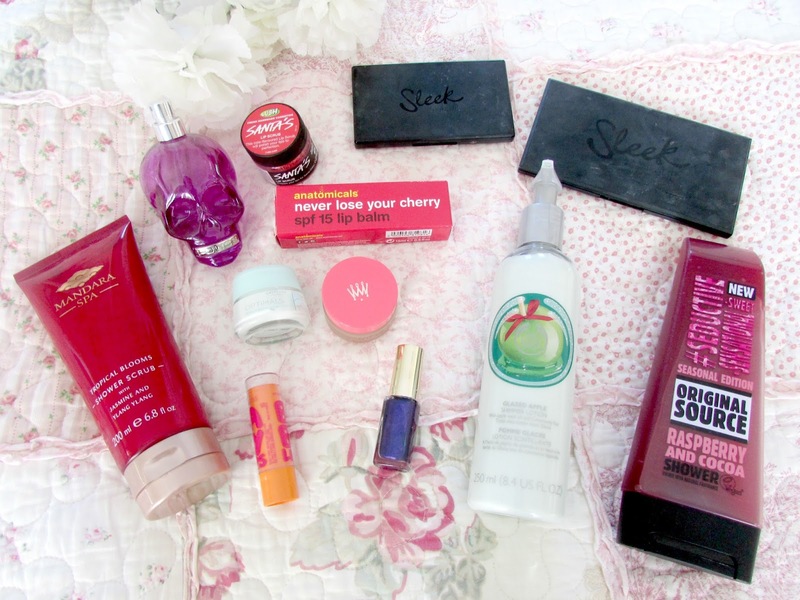 OMG I need that pink Nuxe balm! These products look so nice and I really like that blush palette. Great post. the blush by three palette! I also love the Glazed Apple. It was for Christmas only, and I bought extra of the perfume of the scent on sale after Christmas. They had a lip balm too (and a gloss, which was too sticky), but they'd run out of the balm well before Christmas and this range sold out so quickly! I was lucky to get the perfume! Yes I also hope they bring it back! I haven't tried the Sleek palettes but they look so pretty! !